It is a electronic circuitry (more specifically a relaxation oscillator), that maintains a HIGH or LOW at the output terminal for a fixed period of time interval (determined by resistor capacitor pair), when a trigger is being given at the input. Other name is One-shot multivibrator. What the name indicates, is that the output has only one stable state. When triggered it goes to unstable state, remains there for some time and get back to stable state. We'll construct the circuit first with OpAmp and then with 555-timer IC. The following circuit is the monostable multivibrator using 555-TIMER (IC NE555N). Briefly, the charging time of the circuit determines the time period of the output waveform. 555 Timer Block diagram and its Monostable Multivibrator Configuration. 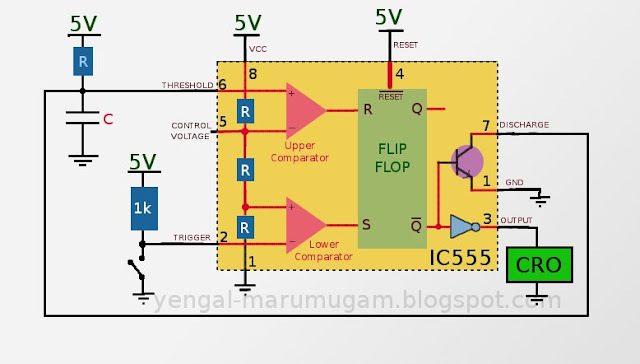 555 timer IC consists of a RS flip-flop whose Set and Reset terminals controlled by two comparators, and a three resistor potential divider network, which divides the supply voltage into three equal voltages . In case the supply voltage is 5V, it divided in three resistors as 1.667V. Therefore, the inverting terminal of the upper comparator is connected to 2Vcc/3 = 3.334V and the non-inverting terminal of lower comparator is connected to Vcc/3 = 1.667V. In addition 555 Timer IC also contains a NPN transistor. Its emitter terminal is grounded and collector terminal is called 'Discharge' to which we can connect external potential point that can be drained with the help of transistor. The transistor is operated by the RS flip-flop, since its base terminal is connected to the Q' terminal of RS flip-flop. How the Monostable multivibrator is driven into unstable state? When the trigger is applied(i.e switch is closed), the 'Trigger' terminal (inerting terminal of lower comparator) is directly connected to the ground(0V). This toggles the output of lower comparator from LOW to HIGH. So the SET terminal of FLIPFLOP is at HIGH, toggling the Q' to LOW. The output is HIGH. How the Monostable multivibrator recovers from unstable state? As we have seen above the Q' is toggled from HIGH to LOW, which inturn turns-OFF the transistor. The capacitor(C) charges through Resistor(R). When the capacitor voltages just rises above the voltage at the inverting terminal of upper comparator, it toggles its output from LOW to HIGH. This resets the FLIPFLOP, i.e the Q' is again set to HIGH. Thus the transistor is driven into saturation and the cycle continues. 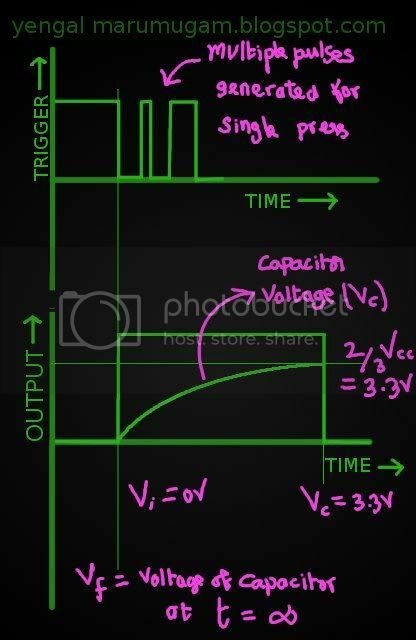 When the trigger is given, the output is toggles for a finite time period determined by the time constant = RC. The design formula derivation is shown below. The capacitor charging equation is used to derive the expression for On-time(unstable-state) for the output waveform. 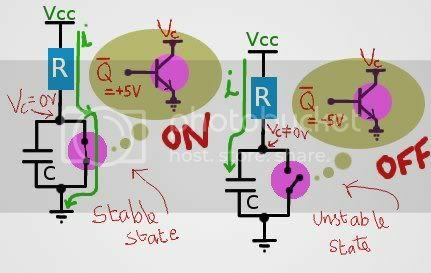 Vf is the voltage of the capacitor, if it is allowed to charge for infinite time period. It is equal to the given supply voltage. The figures on the right and below explain the derivation more elaborately. The main application of Monostable multivibrator is switch debouncing, where multiple pulses are generated for single press of the switch. 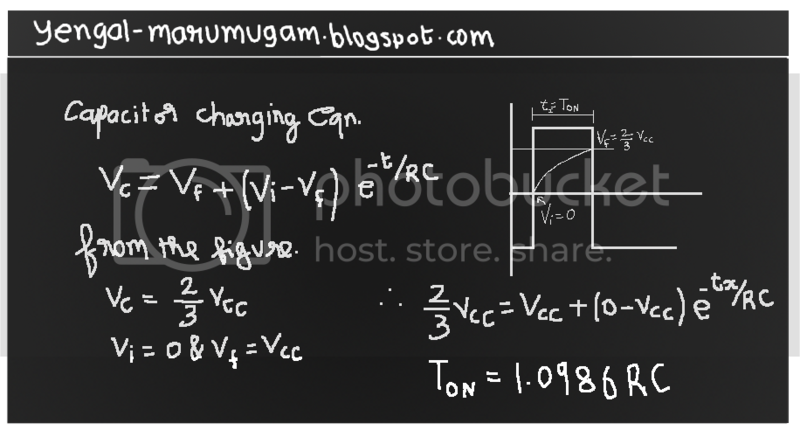 It is also used for the conversion of frequency into proportional voltage. In my next post we will learn about the frequency to voltage(F/V) conversion.